I interviewed Dr. Andrew Weaver in December 2011 just before the latest round of international climate change negotiations in Durban, South Africa. He is the Canada Research Chair in Climate Modeling and Analysis at the University of Victoria and one of the key authors of several of the UN Intergovernmental Panel on Climate Change. I thought it would be worth posting this interview now in its entirety given that Dr. Weaver is once again in the news today. It seems he has just published an article in the journal Nature in which he analyzes how burning all global stocks of fossil fuels would influence global temperatures. He found that mining and burning all of the tar sands oil of northern Alberta would raise global temperatures by about .36 degrees C. By contrast, burning all of the world’s vast coal deposits would increase temperatures by 15 degrees. Naturally, we can expect tar sands advocates to jump all over this analysis but they should probably think twice before leaping to any premature conclusions. Dr. Weaver’s analysis does not consider the other, very significant impacts of tar sands developments including the destruction of boreal forest, pollution, water consumption, health impacts and so on. 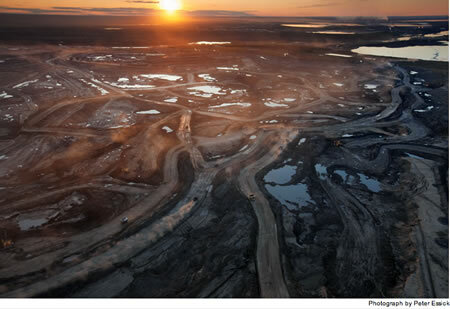 Greenhouse gas emissions from tar sands operations are still higher than conventional oil and the various tar sands projects underway constitute the largest industrial project on Earth. Dr. Weaver has also made it explicitly clear on many occasions (as he did in our interview in no uncertain terms) that he feels we have to get ourselves off fossil fuels as soon as possible by putting a price on carbon. He believes governments have an active role to play in helping us do so. In our chat, he expressed his extreme disappointment and dismay with the current Canadian government and speculated as to why they are so obstructionist in the face of overwhelming scientific evidence about the serious dangers of continued fossil fuel use. His latest analysis simply looks at the relative contributions to global warming from the various sources of fossil fuels and concludes that coal and gas are by far our biggest long-term problems, not oil. This is a quote worth remembering, and repeating. Dr. Weaver is not an expert on any aspect of the oil industry, nor is he an economist thus I do not believe he has any qualifications to make recommedations insofar as us switching from one form of energy to another. He should stick to mathematical modelling.